دمی باقالی/باقلا Dami baghali is a combination of rice and dried yellow fava beans cooked together slowly over low heat. 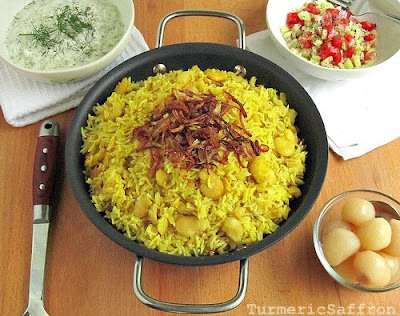 The result is a flavorful rice and beans dish that is best served with a bowl of mast-o-khiar, salad Shirazi or torshi (my favorite). Nothing beats having this delicious home-cooked meal on a summer day with your family. Dami baghali is one of my husband's favorite dishes and he is usually the one who buys the fava beans for this dish or anything that resembles them! Not too long ago though he mistakenly bought lupini beans instead of fava beans from an Italian market. I still haven't figured out what to do with all these beans and how to cook them. There are different recipes for this rice and beans dish and the difference basically depends on one's tastes and preferences. Some would add a tablespoon of tomato paste or fresh chopped tomatoes. Some serve it with fried eggs (sunny side up) and some people prefer it hot. It may also be served with lamb shanks. 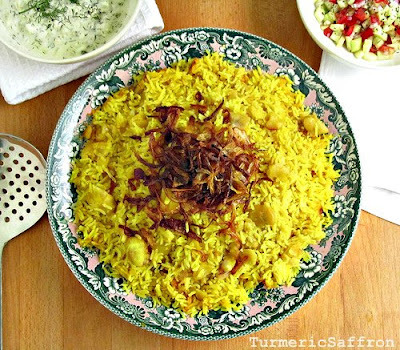 The following recipe is how I like to make and serve dami baghali in our home, simple with no meat and with caramelized onions on top. I also like to use equal portions of rice and fava beans. 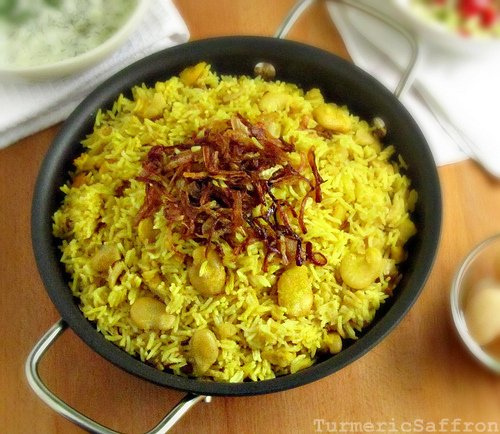 However, it is more common to use anywhere from 1/2 cup to two cups more rice than fava beans. Instead of increasing the amount of rice you may reduce the fava beans to 1 1/2 cups in this recipe if you like. Rinse and soak the beans in 4 cups of cool water for a couple of hours. Drain. Rinse the rice with cool water and soak in 4 cups of water with 2 tablespoons of salt for about an hour before cooking. Drain. Heat about 3 tablespoons of vegetable oil in a large heavy bottom pot over medium heat. Add the chopped onions, saute until lightly golden brown. Add turmeric, stir well. Add the beans, cumin and red pepper. Cook over medium-low heat for 10 minutes. Stirring intermittently. Add the rice to the pot and pour enough water to cover the rice and the beans about an inch above the rice. Bring to a gentle boil over medium heat. Cover the lid with a clean kitchen towel to absorb the moisture. Cover the pot and cook for about 45-50 minutes on low heat. In the meantime saute the remaining sliced onions in 3 tablespoons of olive oil. When the onions become soft and transparent, reduce the heat to low and let them caramelize slowly. Serve rice on a platter, spoon the caramelized onions over top and serve with mast-o-khiar, salad shirazi or torshi. Yummy. What a great recipe for baghali polo. I should totally try to cook this while lava beans are fresh and in season. Thanks for sharing this wonderful meal. What a beautiful dish! As a "fava bean-addict" I can imagine the delicious flavours melting in my mouth! I rally like fava beans, and with this being made with the dried variety, I can enjoy it the whole year. Thanks for the recipe! Thanks again for another inspiring recipe. I tried it just the other day, partly for I was curious about fava beans since I never had cooked them before. I found dry ones from Spain and cooked them according to your instructions, but thought they looked rather tough even after several hours cooking. Found on the internet a description that one should take away the outer skin too before cooking. I did this and then followed partly your recipe, also adding fresh herbs as other recipes do. Big hit! Great as picknick food. Look forward to trying it with fresh fava beans which should come in season soon to my neck of the woods. Sharon, thanks for the comment. I should've mentioned it in the post to use the skinless fava beans. I'm so glad you enjoyed the recipe.